Went out with the camera pretty early this morning because the weatherman warned me it would be bright first thing before clouds and rain would roll in by mid morning.As it turned out it was a very pleasant morning right up to lunchtime. 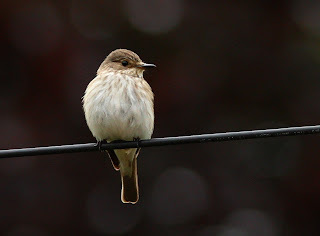 Didn't fancy going too far so I yet again headed to the local churchyard where I've been lucky enough to have seen Spotted Flycatchers.I love these chaps one of my favourite birds.Got there just before 9.00 AM and despite looking round everywhere for ages I had no luck at all . 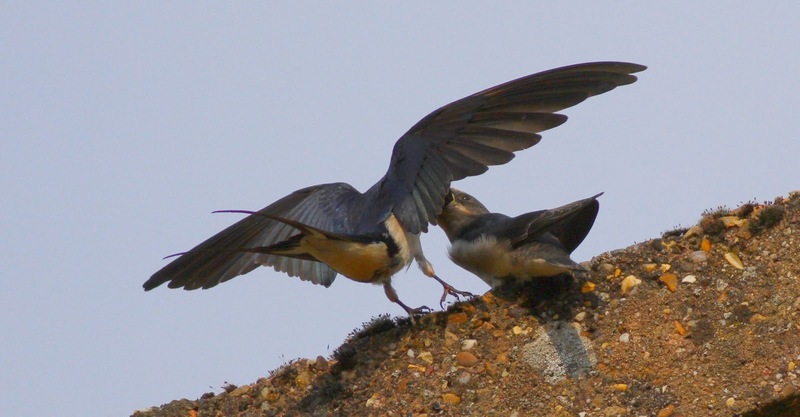 All was not lost because I had noticed some young Swallows waiting patiently to be fed by their parents so I thought I'd try for some feeding shots.Here's a shot of one of the young waiting to be fed. Getting shots of a parent coming in and feeding the young was a real pain.You have to hold and point the camera at one of the young for ages and as soon as you take a rest the parent bird flies in and you miss it.The parents took ages to gather some food and when they come in they stay for a split second and they usually feed the young bird you are not focussing on.Did manage a few decent shots though. Needing a rest from the Swallows I waited patiently for a Spotted Flycatcher to show.Eventually one showed but it only stayed for two minutes before flying off.It returned twenty minutes later but flew off after only one minute.I don't think there were many flies flying around and they were feeding in the trees. Didn't do so well as last time on the picture front but great to see and I did manage another flight shot. I was keen to go out with the camera this morning because due to recent poor shots taken at Ham Wall/Shapwick Heath I'd had a go at micro adjusting the lens to camera hoping shots would now be a little sharper. Deciding to stay local I thought I'd go to Marsh Lane but first over to the churchyard were I'd found a pair of Spotted Flycatchers earlier in the month.Although I'd seen the SF's on previous visits I'd failed to see them on recent visits. After an hour searching the private garden area and round the churchyard I'd not seen hide or hare of them but just as I was about to leave I saw a small bird land on top of a distant gravestone.It was a Spotted Flycatcher.I immediately slipped into fieldcraft mode and slinked along in the shadows until I got into range. Chuffed to bits to see one of my favourite birds using the gravestones to catch flies I managed some decent shots. After no more than a couple of minutes a large man wearing the brightest red shirt I've ever seen appeared from no where and walked right by the bird.He must have seen me taking shots.What a burk !! My little friend flew off and did not return by the time I left an hour later.Got a flight shot though. I then went over to Marsh Lane and found this delightful young Reed Bunting on the causeway.The lens/camera micro adjustment seems to be working. When I went into the Oak hide I found three of my mates in there : Brian , Jeff and Peter.Some entertaining chat ensued and very little birding I'm afraid. A FEW DAYS AT THE SOMERSET LEVELS. Last week I decided to have a few days away birding and I decided rather than go to Norfolk my usual haunt I'd go to the Somerset levels again. This was a brave decision as a photographer because both the reserves at Ham Wall and Shapwick Heath are more suited to birders with powerful scopes as the birds can be too distant for decent shots unless you are very lucky.On the plus side though you have a very good chance of seeing Marsh Harriers,Great White Egrets,Bitterns and Hobbies there. Left Knowle pretty early on Wednesday and got to the car park just before 9.00 AM.It was a very nice day and it was already very warm as I headed down the track to the Ham Wall reserve.Quite soon I came across the Little Bittern viewing station and joined a few birders there but since the pathways near the nest had been closed the viewing station was a long way off from where the birds show. I soon moved on and for the next few hours I had very good views of Marsh Harriers,Bitterns and Hobbies but all too far off for my lens.In fact the only pics I'd got all morning was of a Dragonfly which were all over the place. Just as I finished lunch by the furthest viewing platform a warder told me a Night Heron had just been seen further down the track.It turned out to be a further mile down the track so when I got there I was very hot and knackered.Worse of all it could no longer be found.I was now 3 miles from the car park and a life saving drink.I might need the Air Ambulance. After making it back to the car park alive I headed down the Shapwick Heath track.I was still struggling to get any decent shots as the Garganey and the Black-tailed Godwits etc on the first scrape were a long way off.Did get a shot of one of the Little Egrets as it flew by. From the hide on Noah's Lake I was very pleased to get a shot of a Great White Egret although yet again it was distant. After an early tea I went back in the evening to the Ham Wall reserve where it was sunny and still very warm.Managed some shots of a Marsh Harrier drifting over the marsh.It looked stunning in the evening sun.Oh for a big lens. At 7.00 PM I went and joined a couple of birders at the Little Bittern viewing station.One of them 10 minutes before had seen the male flying left from the nest area at reed top level.Half an hour later one of the birders shouted "There's the female". I had a 2 second view of a brownish bird flying fast just at reed top level before it dropped down.I am not sure whether to tick it or not as it was a very short and a very distant view. 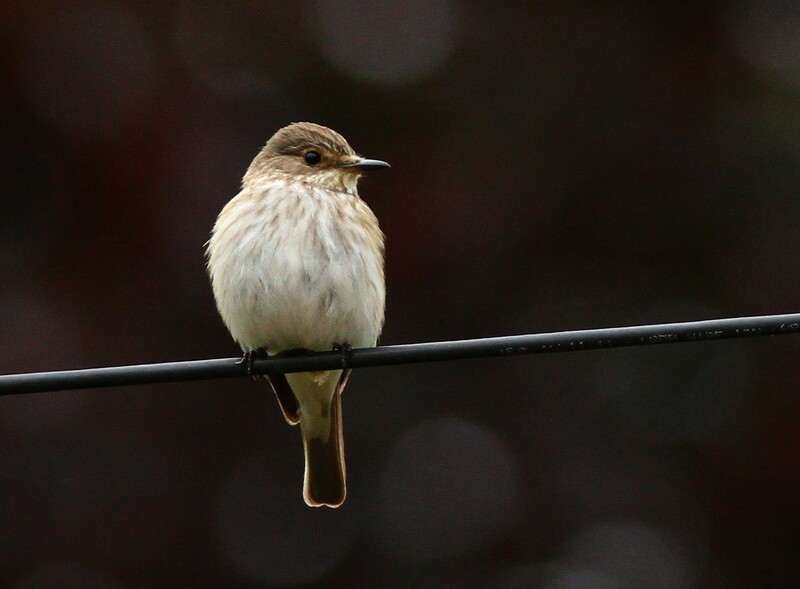 On Thursday morning I was in the car park at 8.30 AM.It was very gloomy and there was a damp mist but I was very pleased because the forecast the night before was for "Heavy rain all day with thunder and strong winds"At least I could do some birding. I hadn't gone too far along the Shapwick Heath track when I heard several Cuckoos calling.There were four of them flying around together.Never seen so many in one place before.Only got one shot which shows how gloomy it was. I then had a good walk round and visited the nearby hides and screens.Saw loads of Warblers,Harriers etc but far too gloomy for any shots.On the walk back to the car park to have some lunch I was delighted to see a Great White Egret on the scrape.That was the good news because it was a long way off and it was still very gloomy but I don't want to moan too much as they are great birds and I got some shots of it with a decent sized fish. I missed it with the fish it's mouth but got some shots of it going down it's neck. Whilst the Egret was performing a Bittern flew past. Got a shot of the two Egrets together which shows very nicely the size difference. In the afternoon with rain threatening I jumped in the car and went to Westhay Moor another reserve about 3 miles away.It was a very nice reserve well looked after with several good hides and lakes,marshes woodlands etc. I didn't see much when I walked round but it was very gloomy.Worth another visit. The weather was a little better on Friday with it being much brighter.As I approached the scrape along the Shapwick Heath track a Peregrine flew over and scared everything off.This is a shot of some of the Godwits just as they flew off. Spent a long two hours in the Meare Heath hide trying to get some closer shots of a Marsh Harrier but failed.There were several about on the heath but none would come close.This is the best I could do which is pretty disappointing.To make matters worse a Bittern flew past twice and I missed out on both occasions. Later on that day the Great White Egret was on the scrape again and although the weather was brighter than yesterday the bird was even further away. It was pouring with rain on Saturday morning and it was very windy and pretty chilly so I decided to head home.A very enjoyable break with some great birding but not so good on the pics front. As I hadn't been to Marsh Lane for a while I decided Tuesday lunchtime to go there and have a quick look round.Got there just after 1.00 PM to find it a bit gloomy but thankfully dry. Got a few shots of this Reed Bunting that was pretty good at finding food. There were plenty of birds on both pools including loads of chicks but I could not find anything exciting to point the camera at.Had the best fun on the reed bed pool where three young Reed Warblers were showing one of which must have had some Weetabix for breakfast because it was very lively and vocal. For the half hour I was there it darted in and out of the reeds stopping briefly to sing out before darting off again.I didn't get any great shots as it was too quick for me and the cunning fox was using a Reed Bunting as a wing man which it would send out to distract you while it popped up some where else.Great fun trying to get shots. I was impressed with this lone Redshank chick that confidently strutted around feeding on the car park islands. 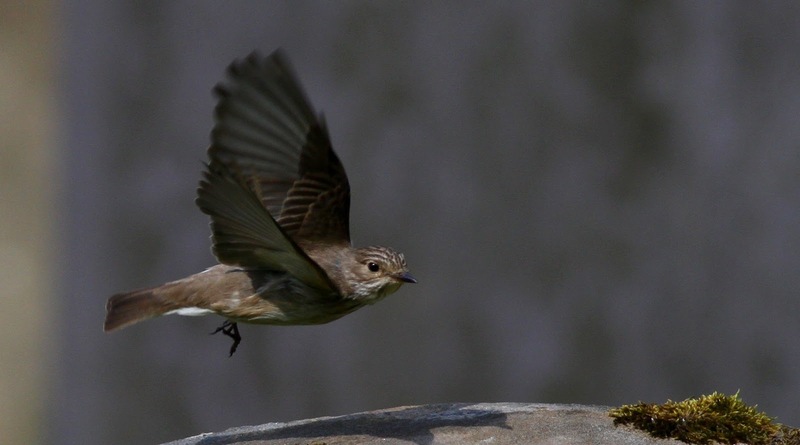 Having stayed in on Sunday and with the forecast not looking good for the rest of the week I popped out Monday lunchtime and went to see the Spotted Flycatchers again. 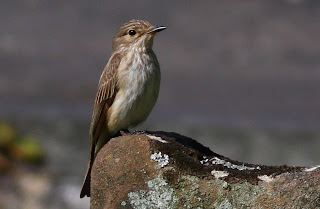 They showed again a few times during my hour long stay but as before they remained in the private garden.Did manage some slightly better shots but not up to the standard of the ones taken last year at Napton on the Hill churchyard but still great to see.